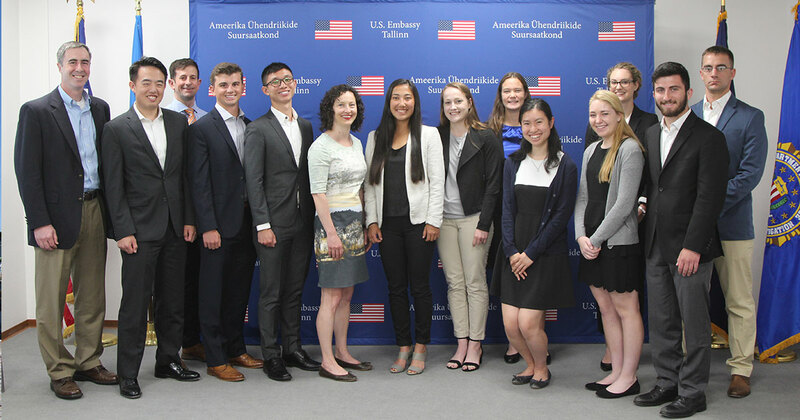 After arriving in Tallinn to warm weather and sunlight, the Tufts, West Point, and Naval Academy contingents began the Joint Research Project at US Embassy Tallinn. We met with Deputy Chief of Mission Elizabeth Horst, ODC Chief Jason Gresh, Defense Attachè Povilas Strazdas, Political/Economic Chief John Spykerman, and Assistant Public Affairs Officer Julia Smart. The meeting at the embassy was an important first step as each officer we spoke to provided us with a rundown of basic cultural and political information which in turn, allowed us to be better prepared for our future interviews. Our research topics range from internal and external Estonian security to the financial impact of NATO and EU membership on Estonia. Furthermore, visiting the embassy was a beneficial way to see how the United States carries out its mission abroad. In the days following, we have met with researchers at the International Center for Defense and Security, representatives from the Ministry of Finance and the Estonian Defense League, and Lauri Almann, the former Permanent Secretary of Defense during the 2007 cyber-attack on Estonia who is now a cyber security expert. Our meeting with LTC. Lillenurm of the Estonian Defense League was helpful for my research in particular. He briefed us on the extent to which the Estonian Defense League operates around the country and the specific methods and policies of the Force which act to deter a Russian invasion and to prepare the Estonian civil force for war. He outlined how the primary objective of the Force is deterrence and how, through different operations and fighting groups, they have been successful in achieving that objective. We also toured Estonia on cultural excursions that have included visits to the Old Town, and to Narva, on the Eastern border with Russia. Narva was particularly interesting for me because of my study of Russian language. Being within eyesight of the Russian border was an interesting experience for the entire contingent. For many of us, it will be the closest we get to the Russian border and seeing the crossing in person emphasized the proximity with which Estonians in Narva and Russians in Ivangorod live. As I write this post, we are currently on the ferry to travel to Helsinki for a cultural excursion and research opportunities. After Helsinki, we have meetings with professors from Tallinn University and Major General Martin Herem of the Estonian Defense League. We round out the trip with a day trip to Tartu for a meeting and tour of the Estonian Defense College. Having already traveled to Narva, going to Tartu will give us a complete look at the three largest cities in Estonia and give us a better understanding of not only how the Estonian government represents its citizens but also the way of life and political views of different cities and towns around the country.